Let’s eat like Southerners, shall we? A part of me daydreams about moving to the south, New Orleans maybe, where the weather is milder and the people are nicer. I picture myself hosting barbecues on weekends or having some friends over for sweet tea and biscuits in the middle of the afternoon. But then I think of leaving NY and I just can’t do it! The city has a spell on me… A relationship of love and hate that ties me to this weird city in such a powerful way that not even my hometown did. But I digress! What was I saying? Ah, Southern food! Extremely fattening food (Hello, fried oreos?!?) that tastes so good that you end up not caring. Think Paula Deen! If I ever met Paula Deen, you know what I would make for her? 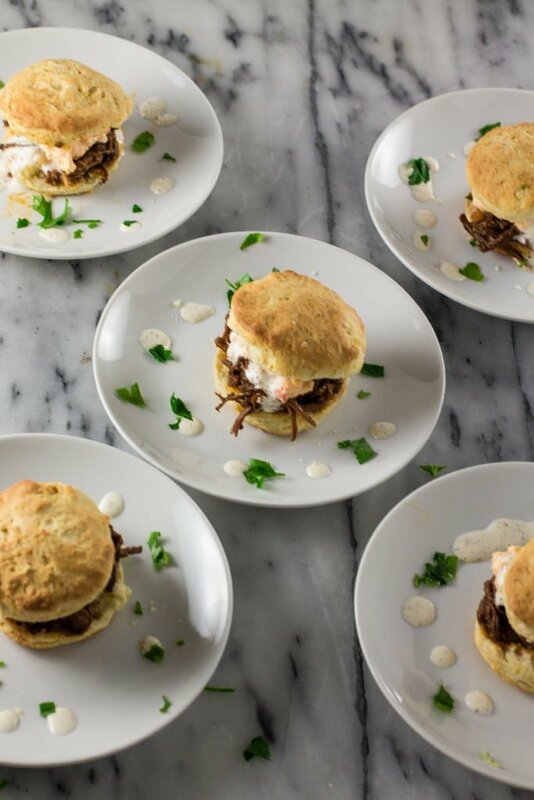 These White BBQ Brisket Sandwiches, which I consider pretty guilt-free because they are bite-sized and therefore perfect for a party or for when you have friends (Paula Deen!!!) over! This is one of those dishes that you can make from scratch or take a few short cuts if time is an issue! I made everything from scratch: biscuits, pulled brisket, white BBQ sauce and pimento cheese. However, feel free to find the store-bought version of some of these ingredients to make your life easier. Not that making it from scratch is hard, on the contrary. The pulled brisket, as you already know, is very conveniently made in the crockpot. Thank you for listening reading my first world problems! You would probably like to know that I did find a recipe for homemade White BBQ and it was as easy as putting the ingredients in the blender! So crisis averted! 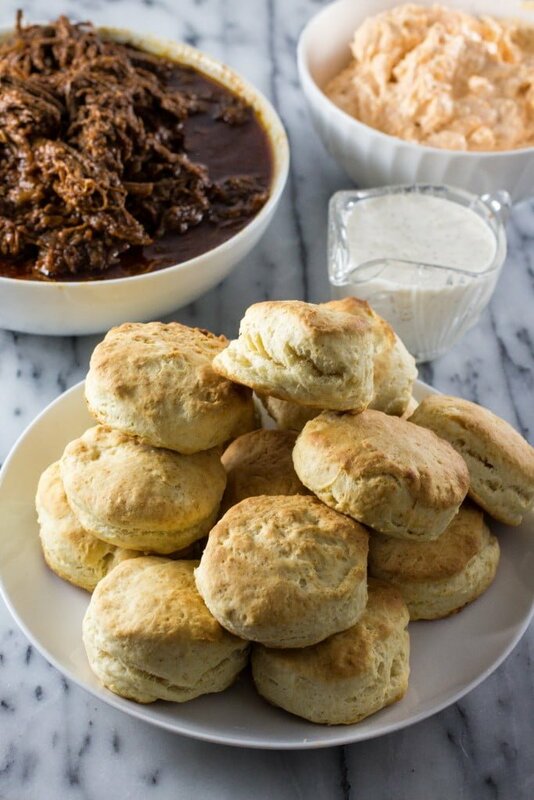 Can you believe I had never made homemade biscuits before I decided to make these sandwiches? It’s so incredibly easy! They bake for only 10 minutes or so and they are so flaky/tender/buttery! I will definitely be making them more often. And now it’s time to combine all these amazing ingredients to create the most delicious, luscious White BBQ Brisket Sandwiches! That time when everything comes together and you understand that all the hard work was definitely worth it. You get to assemble the sandwiches in any way you want. I like to do: pulled beef first, then pimento cheese and finish off with the white BBQ sauce! You can even make all the ingredients ahead of time, as they will all benefit from a day or two in the fridge, and have them ready to assemble before serving. The biscuits will keep fine for up to 2-3 days in an airtight container in your pantry. Don’t forget the napkins, as these sandwiches are a little on the messy side with all its sauciness. I suppose some people could chomp them down in one bite, but you’ll most probably need two or three if you wanna maintain a certain level of elegance. However, it’s understandable when elegance goes out of the window because you are eating a buttery saucy yummy sandwich. You will be lost in its hint of sweetness, tanginess, spiciness and manners will be the last thing on your mind. That’s ok! I bet even the most judgmental southern old lady would forgive you! 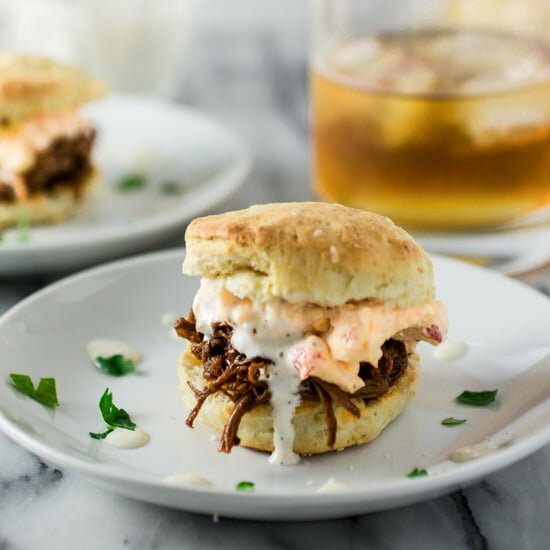 Buttery and flaky biscuit sandwiches loaded with shredded brisket, pimento cheese and white BBQ sauce! So delicious that you won't resist eating more than one! Add the flour, baking soda, baking powder and salt to the bowl of a food processor and pulse a few times to combine. Add the buttermilk and pulse just until combined. Do not over mix! Fold the dough about 5 times and then gently press it until it's 1 inch thick. Using a 2 inch round biscuit cutter, cut the biscuits (pushing straight down through the dough, without twisting!) and place them in a baking sheet covered with parchment paper, about 1-inch apart. Gently knead the scraps together to make a few more, but be aware those won't be as flaky as the first ones! Bake for 10 to 12 minutes or until the biscuits are light golden brown! Be careful to not over bake! Using a mixer, beat the cream cheese until smooth. Add the rest of the ingredients and beat until the desired consistency! Combine all ingredients in a blender and blend until smooth. Add more mayo if you want a thicker consistency. Cut the biscuits in 2. Fill them with a layer of pulled beef, pimento cheese and white BBQ sauce. Close them and serve! This is the ultimate comfort food! These look cute and very delicious Olivia! I’m definitely making the biscuits this weekend! Basically the best comfort food ever! This looks amazing, from the biscuit to that sauce, yum. Adorei! Principalmente fazer os pãezinhos em casa, que ficam deliciosos! Parabéns, você está cada vez melhor!!!! nice work on making homemade buns for the first time! and this is my introduction to a white BBQ sauce, sounds fantastic. southern food just screams summer! Olivia, I love this recipe! It looks so amazing. 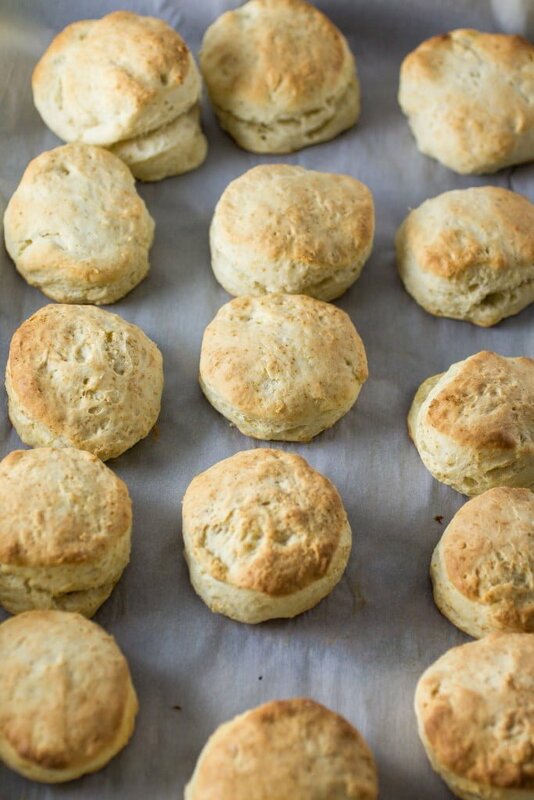 I love that you used homemade biscuits and your biscuit recipe looks perfect. I definitely need to try it. Also – your site is so beautiful and clean. I love it! I am so intrigued by the white barbecue sauce! Wow! These brisket sandwiches look incredible! I’m technically from the south (born and reside in FL… even though we don’t consider ourself or our cuisine “southern”)… and I say heck yes you can say whatever you would like! Freedom of speach for all♡ lol.. especially food bloggers! 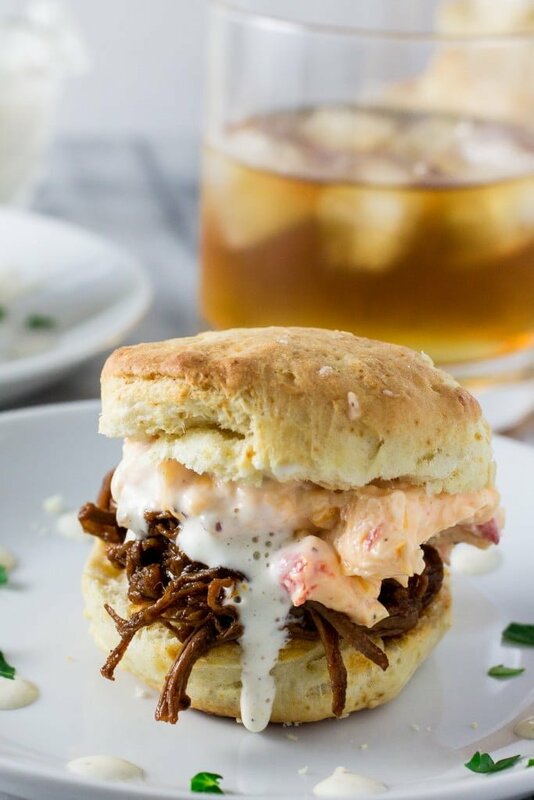 These white bbq brisket sammies look killer.. totally giving these bad boys a try! Cheers and thanks for sharing! My mouth is watering, this is pure temptation in the shape of a sandwich! You got me very curious to try this combination of flavours! !